On 10-15-2012 at about 1830 hours the Humboldt County Sheriff’s Office responded to a residence located in the 2200 block of McKinleyville Avenue, McKinleyville regarding a marijuana investigation. Sheriff’s Office Deputies discovered a large moving van that was parked near the front door to the residence. Deputies could smell the strong odor of marijuana coming from the moving van. Deputies then knocked on the front door to the residence and contacted three subjects who were in the house. Deputies identified the occupants as Jeffrey Donald Halverson age 25, Lee Dennis Wilson age 27 and Fredrick William Nicholas age 28. When deputies were speaking to the three subjects they could detect a strong odor of marijuana coming from inside of the residence. 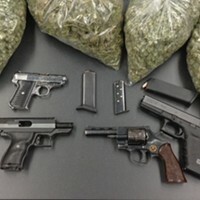 Deputies then detained the three subjects and secured the residence for a search warrant. 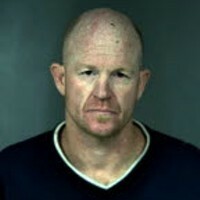 Humboldt County Drug Task Force Agents were then contacted and responded to the scene to take over the investigation. A search warrant was signed by a Humboldt County Superior Court Judge for the residence at approximately 2030 hours. 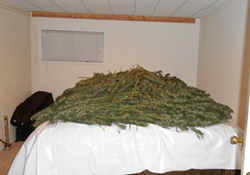 Drug Task Force Agents then searched the residence and discovered approximately 210 pounds of drying marijuana plants located in both bedrooms. Agents located marijuana, butane hash lab in the residence. It appeared to the Agents that the marijuana plants were brought into the residence from the moving van that was parked outside of the residence. Agents arrested Lee Wilson and Jeffrey Halverson for cultivation and possession for sales of marijuana, conspiracy to commit a crime, manufacturing of a controlled substance and maintaining a residence for distributing of a controlled substance. Wilson and Halverson were both transported to the Humboldt County Correctional Facility and their bail was set at $500,000 dollars each. Fredrick Nicholas was arrested for cultivation of marijuana and was transported to the Humboldt County Correctional Facility where his bail was set at $25,000 dollars.